We have all felt the undesirable effects of food poisoning at one point or another, and due to the distressing nature of this food-borne illness, prevention of it becomes a lot easier than dealing with the potential of spending time in the emergency room getting diagnosed, or dealing with the nausea, vomiting and other unpleasant side effects that happen as a result. Often mistaken with the flu, food poisoning can be debilitating and it isn’t long before the illness turns into an emergency all its own, with dehydration quickly becoming a serious concern. Symptoms of food poisoning range from mild stomach discomfort to severe dehydration and even bloody diarrhea. 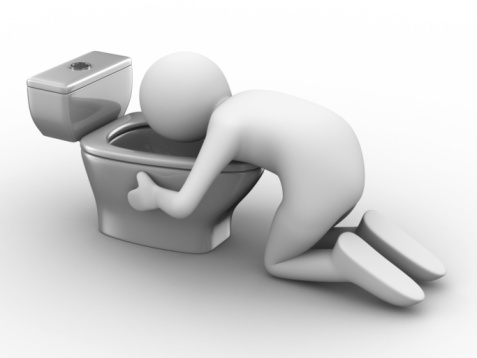 In some cases food poisoning becomes such an immediate emergency that death can result in certain high risk populations. Prevention of food poisoning becomes of the utmost importance when handling and preparing food, as treatment once the issue has started to take its course is much more difficult. – One of the top methods of prevention for food poisoning deals with the handling of meat. Meat that is stored past its prime, or at inappropriate temperatures is a serious hazard for digestive upset, and even much more serious problems. Simply watching the expiry date on your stored meat, and keeping a thermometer handy to check the temperature can make a big difference. -One risky behavior when it comes to the potential of food poisoning is when someone other than yourself is handling your food. So if you go out to a restaurant ensure that you are not served meat or dairy that smells or looks funny. If you are served something that doesn’t look right, you should never feel bad sending it back, and at the same time, make sure you ask the server to get you a new, clean plate as well, as the affected particles of food can easily be transferred back to you if the same dishes are used, even with different food on them. -Along the same lines of undercooking, comes under cooling. Always make absolutely sure that all food you don’t use at a meal is promptly covered and refrigerated. Make sure leftovers that don’t get used in an appropriate amount of time are thrown out, so they don’t interfere with future food preparation, and hopefully aid in the prevention of future food-borne illness. -When it comes to preparing food, make sure surfaces are cleaned with warm water and anti-bacterial soap. Keep in mind that certain surfaces are breeding grounds for all kinds of bacteria. Such as wooden cutting boards. If you use wooden cutting boards, they should not be used for meat of any kind, save this type of surface tool for cutting breads. Food poisoning is a very uncomfortable affliction, that once you have it, it becomes very difficult to do anything other than let nature take its course. That’s why prevention is the key recommendation by experts. Staving off the potential for emergency is so important as dehydration becomes a very real concern, so take particular care when it comes to food preparation, you’ll thank yourself for the few extra moments spent!